A presentation on the current state of culture-based fisheries practices in Vietnam. A presentation on the current state of culture-based fisheries practices in China. Culture-based fisheries: What, why, where and how? A briefing on the context and relevance of culture-based fisheries in rural development. 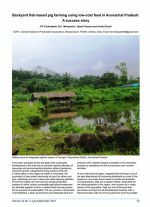 In the north-east hill region of India, integrated fish farming is one of the best alternatives for improving livelihoods as most of the houses in rural areas have access to ponds and livestock. Among livestock, pigs are a popular choice, particularly for the tribal population of the region, who account for a major portion of the population. Pigs can fit into diverse systems of management, and can be reared on a wide variety of waste materials. Each year, the Sustainable Rice Platform brings together its members and dialogue partners to discuss collaborative approaches and innovative solutions to critical sustainability challenges facing the rice sector. This year, the SRP will convene the First Global Sustainable Rice Conference and Exhibition, from 4-5 October in Bangkok, Thailand. The China Aquatic Products Processing and Marketing Alliance will convene Asia Pacific Aquaculture Expo (June 30-July 2, 2017) and Global Aquaculture Summit (June 29-July 1, 2017) in Fuzhou City, China. The Asia Pacific Aquaculture Expo is the only aquaculture themed exhibition in China, covering the whole industry chain from feed, seed, to machinery and products, while the Global Aquaculture Summit is China's top aquaculture conference and enjoys a high level of international participation. 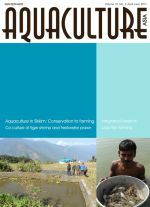 Inspiring story of aquaculture in Sikkim - a journey from conservation to farming; farming of scampi and tiger shrimp together - a case study from West Bengal; Labeo pangusia - a candidate for diversification of hill aquaculture; sustainability of an integrated livestock-fish-crop farming system as a small scale enterprise; sustainable coastal aquaculture in India; potential scope and prospects of domestic fish market in Chhattisgarh. 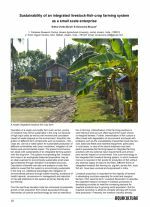 We examined the sustainability and economic viability of a model integrated livestock-fish-crop farming system developed by the Fisheries Research Centre, Assam Agricultural University, over an extended period of 13 years. The system was developed as an ecologically sustainable alternative technology for small and margin farmers. It incorporates two livestock components, pig and poultry, with horticulture and carp polyculture. Analysis of cash flow and benefit-cost ration revealed the system to be economically sustainable over the long term.